The rise of renewable energy has disrupted the traditional regulatory structure governing electricity. Unlike traditional fossil fuel power plants, wind and solar facilities are geographically constrained: they exist where the wind blows and the sun shines. Large-scale renewable energy is more likely to flow interstate, from resource-rich prairie and Southwestern states to energy-hungry population centers elsewhere. The difficulties of coordinating interstate electricity policies have led some to call for greater preemption of the states’ traditional duties as chief regulators of the electricity industry. But while preemption would eliminate some state-level roadblocks to interstate cooperation, it would sacrifice many of the benefits of local knowledge and experimentation in a diverse and innovative new marketplace. This paper examines the benefits of a cooperative federalism approach to electricity regulation. The challenges facing renewable energy are regional in scope, and there is value in preserving state and local voices in policymaking decisions. 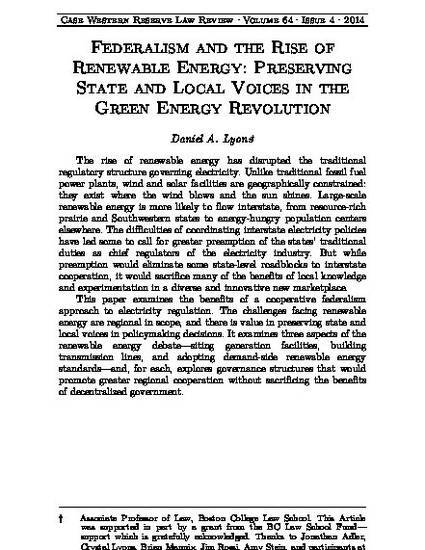 It examines three aspects of the renewable energy debate—siting generation facilities, building transmission lines, and adopting demand-side renewable energy standards—and, for each, explores governance structures that would promote greater regional cooperation without sacrificing the benefits of decentralized government.